It’s Twitter Tip Tuesday — every Tuesday we’ll focus on one Twitter Tip and show you how to integrate it into your social media strategy. 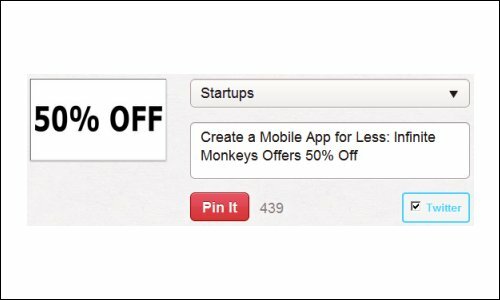 This week we show that a great source of Twitter content can be found by simply tweeting your pins on Pinterest. For the seasoned social media professional, coming up with content might not be that much of a challenge. Small business owners, however, are sometimes at a loss when it comes to finding content to tweet about beyond their products and services, or their latest specials. A great source of popular, effective and engaging content can be found within your Pinterest pinboards. After all, Pinterest generates more even more referral traffic to websites than Twitter itself! So, if you need an infusion of content that’s likely to be viewed, shared and retweeted, make sure to tweet your pins on a regular basis. You probably already have a good handle on how to actually pin images from websites and blogs. But if you’re not already doing so, make sure to select the Twitter check box (as in the image above) when you pin images to Pinterest. That way, the image and its corresponding link will not only be pinned to your pinboard, a link to that pin will also be posted to Twitter. Because the Twitter link includes the word “pinterest” (http://pinterest.com/pin/2184246506… ) people are automatically more curious about where that link will lead and are more likely to click it. You can also tweet links to pins that have already been uploaded to Pinterest. When you log in, you’ll see a variety of pins that have been uploaded from the people you’re following on that platform. Click on any image that’s compelling. A new window will open showing you the full-size pin, along with the owner of the pinboard, options to Like on Facebook, tweet on Twitter and so on. Before you hit the “Tweet” button, however, click the account name at the top of the page. A new window will open listing the complete profile of the pinboard owner. Hover your mouse over the Twitter bird icon, just to the right of the profile owner’s picture. The name of that person’s Twitter account will appear in the bottom left corner of the screen. Make note of the Twitter account name and close this window. Now, you’ll be back at the pin you want to tweet. Click the Tweet button on the right side of the page. A pop-up window will appear displaying a tweet to this pin. Delete the Twitter handle “@pinterest” from the tweet. Instead, insert the Twitter handle from the pinboard owner you made note of in the previous step. This will give credit to the owner on Twitter, letting him or her know that you’ve tweeted this pin. Don’t forget to periodically repeat this process for pins on your own pinboards too! 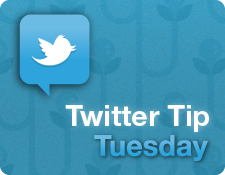 Have any great Twitter Tips you’d like to see in Twitter Tip Tuesday? Let us know in the comments, along with where we can reach you if we use your tip!